Sensorineural deafness is the name given to hearing loss caused by damage to the tiny hairs of the inner ear that transmit sound waves sending them to the brain for interpretation or damage to the nerves involved in sending sounds to the brain. As this type of deafness affects the inner ear and nerve pathways to the brain, soundwaves are experienced as normal until they reach the inner ear.Deafness can occur slowly as with age-related deafness, or can come on suddenly after exposure to loud noises.A common sign of sensorinural hearing loss is the inability to hear high-pitched sound frequencies, such as women’s or children’s voices. This can often be distressing for the sufferer and cause retraction from social situations for fear of being unable to interact successfully with others. There are many causes of this type of hearing loss and a thorough examination and exploration of possibilities, using questions between the doctor and the patient, will be required.Loud noises can cause trauma to the ear and impair of destroy the function of these tiny hairs leading to hearing loss, as can viral or bacterial infections, which can also affect the nerve pathways. This type of deafness can be of a sudden onset, causing a great deal of distress and anxiety for the sufferer. Medical help must be sought if this occurs as it can be dangerous for the sufferer and a diagnosis must be made. Age plays a large role in this type of hearing loss as the hairs become fragile and hair loss of the cochlear is common. This type is called progressive or acquired hearing loss and develops over time, meaning the person has time to adjust to their new situation.Rarely, benign or malignant tumours can cause damage to the auditory nerves or pathways to the brain and are included in this type of disorder. Certain drugs, including some powerful anti-biotics can cause sensorineural hearing loss, sometimes permanent, and can also cause tinnitus to occur.Occasionally deafness of this nature is due to a birth defect either developing during the embryonic stages, this is known as a congenital disorder. Conditions of this nature are often incurable and those who suffer sensorineural deafness will often benefit from the use of a hearing aid. These devices may need to be updated regularly if the condition deteriorates.As technology develops, these devices are now extremely discreet, easy to use and are often very affordable.In some cases, such as early detection and treatment of infections and tumours, hearing loss can often be restored of prevented from deteriorating further. 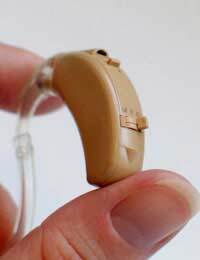 Sensorineural deafness is not a particular disorder itself, more a given term for a collection of disorders that can affect the inner ear or nerve pathways.It is most often non-reversible and can progress to total deafness, either over time or very suddenly.The best treatment option is to find a suitable hearing device. As there are a great many conditions that fall under the umbrella of sensorineural deafness, there is a great amount of research and learning for physicians to participate in, in order to gain a good understanding of the problems.